Even though cold air and wintry weather is now knocking on New Jersey's door, we'll squeak out one more day of warm temperatures and sunshine. Thermometers fell into the 40s across most of New Jersey Thursday morning — fairly comfortable and quiet for now. Amidst beautiful sunshine during the daytime hours, temperatures will climb to the upper 50s to around 60 degrees by Thursday afternoon. While I think we'll end up a few degrees cooler than Wednesday, highs will remain about 10 degrees above normal. The only weather issue for Thursday will be a continuing gusty wind, up to 30-35 mph at times. The biggest accumulations from this storm will occur on colder surfaces like grass, metal, rooftops, bridges and overpasses. Our ground is still on the warm side, thanks to our recent bout of above-normal temperatures. The National Weather Service has issued a Winter Weather Advisory for most of New Jersey, from Thursday night through Friday morning. New Jersey's highest snow totals will fall over the northern and central parts of the state, where an area of 2 to 4 inches of snow is likely. (The National Weather Service has suggested 5 or 6 inches is possible around Sussex County. But I think that's a stretch...) An inch or two of snow accumulation is expected around Mercer, Monmouth, Ocean, and Burlington counties. South of that, we're forecasting little to no accumulation. I know what you're thinking. 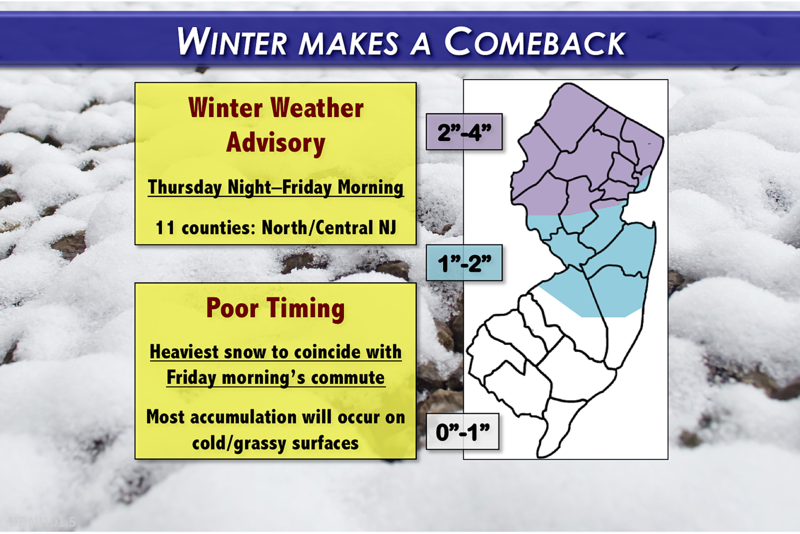 Those snow numbers are no big deal, especially for central and southern New Jersey. So why the concern over this minor winter storm? The period of heaviest snow is likely to coincide with Friday morning's commute. Yuck. Road salt and/or brine should work extraordinarily well to keep roads clear of snow accumulation. However, travel issues are almost guaranteed for a time Friday morning, thanks to drastically reduced visibility and slippery roads. Snow will largely taper off by late Friday morning. Lingering snow showers will be possible through the early evening hours. Behind the snow, a brisk northwesterly wind will bring back some bitterly cold air for the second weekend of March. Friday's high temperatures will reach the upper 30s (where snow accumulates) to the lower 40s (where it doesn't). Friday night through Saturday morning, thermometers will likely dip into the teens across most of the state. As that fierce wind continues, the wind chill ("feels like" temperature) could fall into the single digits for most of the night. Not dangerous cold, but certainly uncomfortable. Saturday looks to be the coldest day of this particular stretch, with high temperatures barely reaching 30 degrees. Winds will calm by midday, with a mix of sun and clouds throughout the day. We had been watching a winter storm for the Saturday night-Sunday time frame. However, confidence is now high that this storm will stay well south of New Jersey. That system may increase cloud cover over South Jersey on Sunday, and could bring a few snow showers. But that's it — we dodged a bullet. If you're looking for some #RealSnow, instead of #FakeSnow or #AlternativeSnow, keep an eye on Tuesday. A coastal storm system will phase with an inland area of low pressure — usually a setup for healthy snowfall. While this storm system's presence has consistently shown up across forecast models over the past several model runs, the precice details (including track, totals, and timing) have been flip-flopping all over the place. In a general sense, this could turn into a significant storm with 6+ inches of snow for part, most, or all of New Jersey. But there's still plenty of time for "wiggling," and so we will sit back and watch for now. We'll keep you posted — I suspect we'll have more details to pass along by late Friday or Saturday.